Depends on the industry. In chemistry the word organic denoted that a compound was derived from a natural substance (ie those that contain carbon atoms). But since we create 100% natural skin care products let's just focus on our industry. But the cosmetic industry, for organic purposes, is tied to the food industry. The organic movement started the same time as the industrialization of farming, so at the turn of the century. Even before the introduction of DDT in the late '30's. People in the know (growers aka farmers) knew the importance of keeping their organic food, … organic and the potential adverse effects of over industrialization of our food source. This was even before the advent of some particularly nasty pesticides that start to come out around WW II. Industrialization of farming and the growing use of pesticides really started to take off after World War II. Not willing to give up, the organic movement pressed forward too. The 60's and 70's gave rise to a growing group of people concerned with conservation, preservation. A return to the natural ways of life. Here's a fun song by Joni Mitchell that kind of sings the sentiment Big Yellow Taxi But it wasn't until the 1990's that the National Organic Program and the National Organic Standards Board (NOSB) came to be. It took until 2002 for the standards to get ironed out. And the rest is current history. 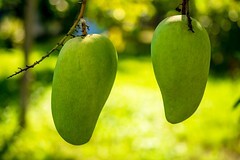 So the seed that was planted and grew into the tree; that was nutured to bare the fruit of the mango; that held the seed pod that was shelled to remove the seed; that was then pressed to express out the oil; which was then shipped to Stick-It.us for us to add with other ingredients to make a body stick deodorant; was guaranteed to be grown and processed without the use of pesticides, synthetic fertilizers, sewage sludge, genetically modified organisms, or ionizing radiation. Beginning to End!! And that helps us sleep at night. So why was it so important for us to create our product with more than 95% Organic ingredients? In case you missed it earlier…we just thought that pesticides, synthetic fertilizers, sewage sludge, genetically modified organisms, or ionizing radiation didn't need to be on your skin. Or in your arm pit for deodorant users! Personally, we don't think you should put that in your mouth either! 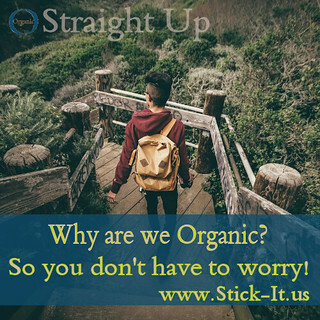 Gettin' the picture of why people are so committed to Organic? Yeah, it's a pretty big deal.